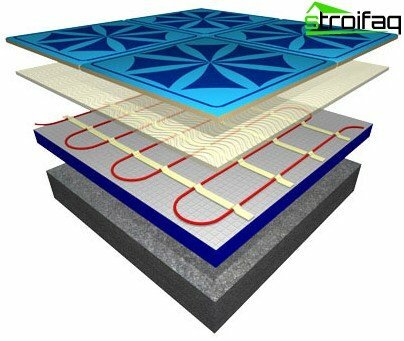 Modern electric underfloor heating is notThey are a rarity and are becoming popular, so to speak, "recognized by the people." 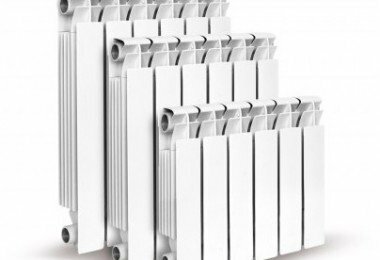 This is to some extent due to the fact that the traditional central heating system is characterized by significant shortcomings, which are not inherent in the principle of the underfloor heating. This new technique - a familiar element of city apartments, country cottages, its presence in the house clearly shows the reasonable effort to create a comfortable home owners, thus efficiently consuming energy. 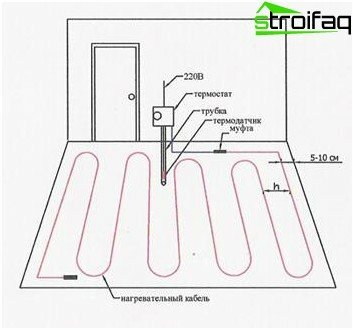 Electric floor heating - cable system with a high degree of reliability, it can be used as an additional room heating and a heating system of the basic type. Such underfloor heating can be installed under theTraditional coating (ceramic floor tiles, porcelain tiles), and a lighter coverings (carpet, laminate). Normally floors with a capacity of 150 W / m². m second embodiment mounted under said floor coverings, and for more severe heating (in the first case) and a large capacity is needed, accordingly, such heating surfaces occurs faster. We should also note the fact that the warm floor with a capacity greater than 200 W / sq. m can be installed in homes without fear of excessive power consumption: thanks to a special thermostat with temperature sensor switches off the floor after reaching the set temperature. comfort - you can rememberknown saying that the feet must be kept warm. 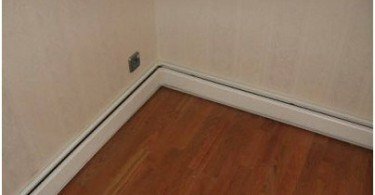 And, true, warm electric floors showed effective results in this regard. 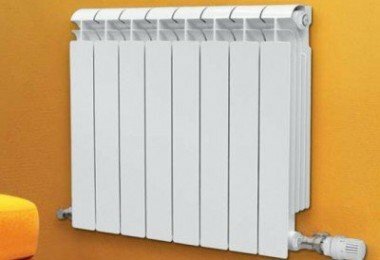 If the room is heated by radiators, the temperature comfortable for the human area is located at the top and near the radiator, because the warm air tend to climb up it. But a heater underfloor situation is quite different: the ideal temperature for the human body is located at a height of 100 cm from the floor, and the colder layers are located in the upper part of the room. This distinction does not cause any discomfort in humans, because it is caused by physiology. Pros excellent, but there is a drawback - a warm reset the electric field is not possible, you will need to buy back floor, tiles and everything else. Electric underfloor heating have good reviews, and many consumers are happy about this miracle of modern technology. Electric underfloor heating are arranged prettysimple and nothing fancy about them. 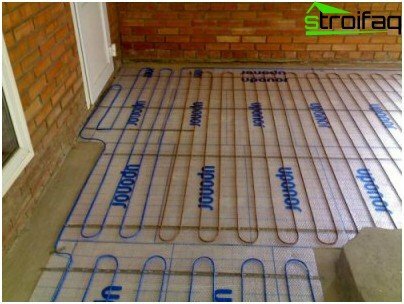 Installation of electric floor heating is carried out at a specific heat insulating material, then filling is made of cement-sand solution over the resulting tie it fits the selected floor material. The source of heat is an electric cable. In case of overheating of the cable may be shortcircuit and destruction of the insulating layer. Repair of electric floor troublesome, because it is very difficult to determine the exact location of the damage. Therefore, buying it is not worth saving, and choose the cable with a high specific heat, and carefully follow the installation distance between the threads. 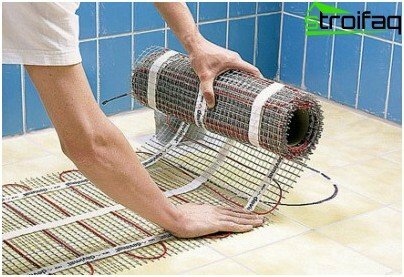 floor heating system consists of heatingsection (mat), the control apparatus (so-called thermostat control sensor), accessories for easy installation (corrugated pipe mounting tape) and thermal insulation. an expensive installation (if it is not made with his own hands). 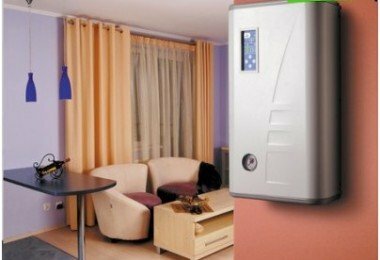 without special permission in urban apartments can not be installed. And the major advantages include the low cost of water compared to electricity, and the installation of water floor cheaper. Everyone decides which option it closer and guided by their personal criteria. What is the electric field is better? With a cable system or termomatovoy and perhaps film floor? By and large they are all different installation method. The cable system - a certain period ofheating cable with a given length. It fits into a cement-concrete floor or tile adhesive zigzaoobraznym principle or spiral (see step 6-12). Important: the cable during installation, you should not cut it. 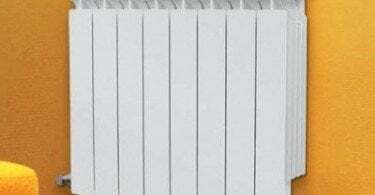 The heating cable is of two types: with self-regulating heating and continuous. The first option is used in the heating of the roof and the second in the "warm floors". Termomaty - heating cable (thin) on the reinforced grid. Laying of electric underfloor heating of this type is made on the finished screed in the tile adhesive layer. Film warm floor - a thin polymer film(0.3-0.5 mm), the heat source is a carbon paste, which is sealed therein. Design features make it possible to lay a film floor directly under the floor covering. If we consider all kinds of, it can be summarized that the film floor is the most versatile, as is suitable for tiles, parquet, laminate, linoleum, carpet. It's time to figure out how to connect the electric floor heating with his hands. Quite often mounted electric floor heating in the bathroom. And rightly so, because it is not onlyadditional comfort, but also good. For example, on a tile floor dries much faster drops of water, and this prevents the occurrence and spread of the fungus. 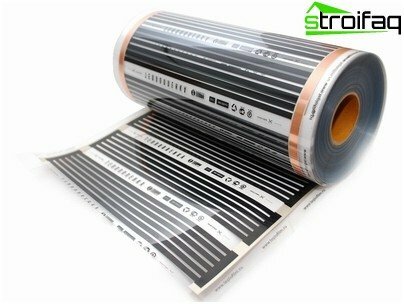 The most popular and widespread type is a heating cable, therefore the article will consider the connection of a warm electric floor of exactly this kind. Before the direct laying placingis released from furniture, to dismantle the old coating and carefully prepared floor surface - aligned, removed debris, if necessary, make thin cement. Next to the wall is prepared a place for the installation of electric thermostat, it will adjust the temperature of the floor. Important: If you want to connect the floor must be equipped with separate wiring. After the preparatory stage, you are ready toinsulation and cable laying. 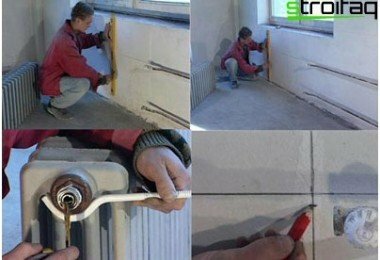 But some masters recommend more and arrangement of waterproofing, to avoid the formation of condensation near the heating cable. For this purpose plastic film. often used for thermal insulation of modernmaterial - penofol, it has a covering foil (14 microns), as well as from a self-adhesive foam layer. This thin and light material that comes in rolls. It gives strength solution, which will be poured later floor. The cable assembly is mounted tapecurable floor. This tape eliminates kinks and thus complied with the required distance between the loops. Normal operation of the electric floor installation is not possible without a temperature sensor. Important: it is necessary to consider the possibility of replacing the temperature sensor in the event of a breakdown, but without destroying the concrete screed. For this purpose, it is usually placed in a tube, and is filled with a coupler. Always checked before pouring,again viewed the correct installation and secure connections. No errors should not be, because it will be difficult to eliminate them, will have to dismantle the tie. Can not only check voltage supply, and also with a tester. Parameters such measurements are specified in the data sheet. If all goes well, you can fill a layer of cementTies 3-4 cm thick. In this filling should be uniform, void-free to avoid overheating and failure of the heating system. And now it remains only to wait for the complete drying of the screed. Lay the floor covering can be in 4 days,control and testing of possible 30 days. 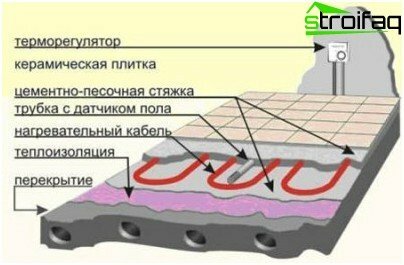 This term is due to thermal expansion when heated floor turn to dry completely, then the cracks and voids, and they are very undesirable. 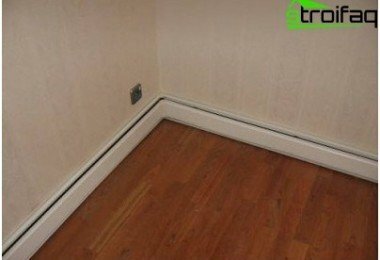 You also need to remember that the heating cable does not fit under furniture. Electric floor heating is not a luxury, it is a successful and pleasant invention, which you need to use and enjoy the warmth. 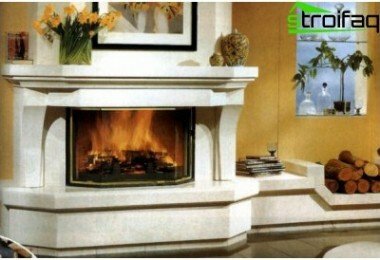 Electric fireplaces: buy or make your own hands?